DB2 Express Edition for Community (DB2 Express-C) is a no charge data server for use in development and deployment. DB2 Express-C supports a full range of APIs, drivers, and interfaces for application development including PHP, C/C++, and .NET. In addition, DB2 Express-C V9 contains advanced XML features. DB2 Express-C provides ISVs an ideal starting database server for Web, enterprise, and eBusiness applications. 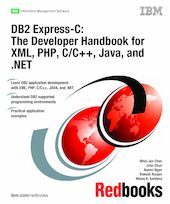 This IBM Redbooks publication provides fundamentals of DB2 application development with DB2 Express-C. It covers the DB2 Express-C installation and configuration for application development and skills and techniques for building DB2 applications with XML, PHP, C/C++, Java, and .NET. Code examples are used to demonstrate how to develop a DB2 application in a different language. By following the examples provided, you will be able to learn DB2 application development with XML, PHP, C/C++, Java, and .NET in a short time.